Note: The following is a guest post by Tableau Zen Master Kelly Martin. I rarely get requests for Tableau dashboards on smartphones, probably because they are usually a secondary concern. That is, most business dashboards don’t automatically translate well to the phone format, so they are not high on the priority list. Here are a few things I’ve learned when making these wee dashboards that might be of help to you. Because of space, you can’t provide a lot of information or detail. It’s not as simple as squeezing down a dashboard that you’ve built to be utilized via PC, and it can be very difficult to provide enough context for specific numbers. For example, the value of sales in the month of December is of limited value without a chart showing the trend for sales, or regional sales, or the number of orders contributing to those sales, or the variance over last month, etc., all of which can’t necessarily be represented on such a small canvas. Let’s face it. Smartphones can be annoying. Squeezing and expanding things to get them to fit or read the way you want can be frustrating. Adding a lot of filters or interactivity to your dashboards may only further frustrate your users and may even cause the untimely death of an innocent smartphone. Fortunately, there’s an app for that. 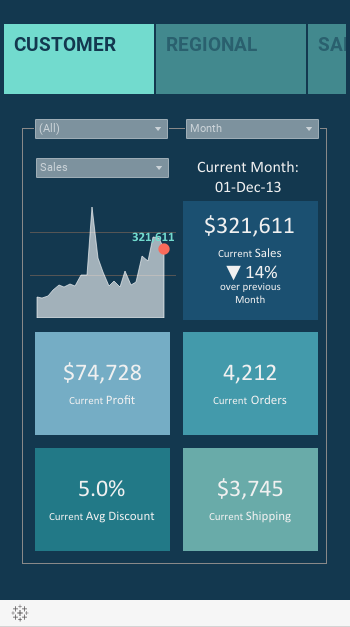 The Tableau Mobile app optimises filters for this medium, making them pop and easy to use. It also allows for logical scrolling, swiping, pinching, and zooming. Unfortunately, my phone, an older model, won’t run the app. When the robot wars come, my phone will find itself impaled on a stick in front of my house as a warning to other robots, Vlad-style. For now, my phone is the best-worst case to use when building dashboards for this medium. If you are in an organization with users with many different brands, sizes, and ages of phones, you will have to deal with trying to find a size and level of interactivity that meets the majority of your users’ phones as well. If everyone’s on a big, fat Galaxy Note, well, lucky you! 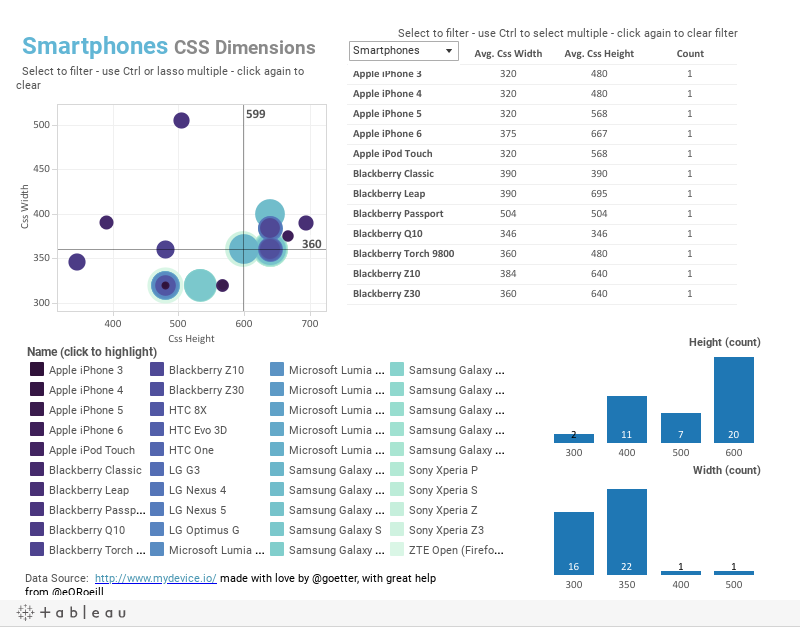 Here’s a resource workbook with CSS dimensions for current mobile devices that might be helpful in deciding the size of your dashboards. Story points work very smartly on a smartphone. This style is particularly great for a group of related dashboards, although they don’t necessarily have to have a story. This example has many dashboards with different focuses, allowing the user to swipe through the story points to find the specific measures they need. For these dashboards, I chose a size of 350 x 600 for the story and 320 x 460 for the dashboards. On my phone (which has dimensions of 360 x 598), the top of the story points are cut off, but I can still tap them. And there is plenty of room for my chubby fingers to slide the view up and down. I added the text box with a border to the dashboard as a guide while placing the elements, but decided to leave it in the finished product as I did find it helpful as a guide when viewing. With respect to interactivity, I kept the filters to a minimum—no more than three per dashboard and specific only to the charts within the dashboard (no global filters). This reduces confusion and helps with performance. On the sales map dashboard, the map interacts quite smoothly and the tooltips behave nicely, appearing and disappearing when you want them intuitively. I don’t know how much smaller you’d want to go with a map, which limits the amount of information you can add. In this case, the tooltip would be a good spot to add additional fields and values. The city sales dashboard (the last story point) is probably the most challenging in this bunch. There are two drop-down filters and two chart actions. The sales trend chart has skinny little bars which allow the user to filter on a time period. I don’t recommend using this chart if you like the people you’re building this for. I left it in as an example of the frustration you can experience. Try it out on your phone. The fat city bars are much easier to use as a filter. 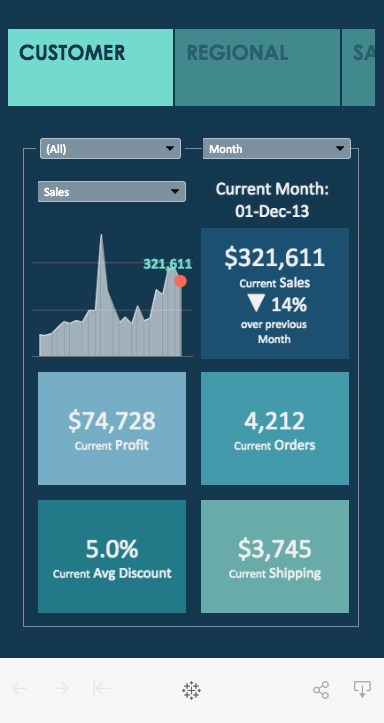 Another option is to lay out your charts on one dashboard horizontally or vertically. The horizontal example uses most of the same charts laid out on one dashboard 1320 pixels wide. The bordered text boxes break it into four screen views. Again, the filters and actions only apply to charts within these views. This format is fairly easy to interact with, but I wouldn’t want to have too many more charts as the load time could slow down. The vertical example (320 x 1860), seen below, is similar to the wide dashboard with a slightly different style. It’s on a light background, with a blue header bar delineating the screen views rather than a border. Personally, I find the dark background easier on my eyes, but I do prefer the vertical scrolling over horizontal. I hope these examples help you with some of the decisions you’ll need to make next time you build a smartphone dashboard. But more than anything, I hope you’ll be inspired to get creative and not be afraid to tame and rule your smarty-pants phone. The issue I run into is the cruft around the viz taking up space. For example the 320x1860 viz. On an iPhone when I click the viz and it pops up it is tiny in the center of the screen. When I go directly to the viz in Public I get a big blue tableau public bar up top, and the viz is off center and had to view. What is the best way to handle this? create a page to embed them in? This is great article - very nice examples for smartphone size. However, I'm having the same issue/question that Thomas C. raised above which is, how to make the dashboard full-screen so you're not seeing all of the normal Tableau Server web page stuff. Thomas and Mike: Yes, the best view is through Public and I too have to then center it. I find I prefer the long dashboard because then the blue tableau bar scrolls away. I believe if Kelly were using Tableau Server and the attendant mobile app that goes with it you would not run into the Tableau Server stuff. I found the Storypoints version worked nicely on my Smartphone. Yes, it popped up rather small, but it was easy to resize. Again, I think in an enterprise environment this would not be an issue. Nice tip josh, just what I was looking for! I tried these on our Tableau server with an iPhone 6. The Story Points seemed to have the best UX (even though we are running 8.3 and I lost the story point formatting). Ultimately I adjusted the dashboard size to automatic so that it wouldn't leave a white gap on my phone since the size isn't exactly. I would still recommend building for the size recommended above before making this change. how you present it on mobile? is it a webpage an APP? Tableau works in the web browser for all modern devices. It is helpful if you use the URL embed parameters that I mentioned above so that it limits the Tableau server 'extras' since you already have the browser header taking up room. Crec que altres propietaris han de prendre aquest lloc web com un model, tipus d'usuari molt neta i excel · lent ambient i disseny, i molt menys el contingut. Vostè és un expert en aquest tema! Thanks for your article, from which I learned a lot. Thank you, this is great design. Do you have these dashboards posted anywhere for download as a workbook? Are these dashboards available for download? It says permissions are needed to download them. Are these dashs available for download as a workbook? could you share?